The Indonesian agricultural sector remains large, comprising 14% of the country’s aggregate Gross Domestic Product (GDP) in 2007. It is internationally significant in its production and export of rice, palm oil, coffee, rubber, cocoa, and spices (nutmeg, cinnamon, and cloves). Half the population is still defined as rural, although this has been declining steadily over the past 50 years as nonfarm incomes have come to dominate agricultural income, even in rural areas. These are common features of an agricultural sector in a growing economy and are generally viewed overall as healthy developments. Indonesia has succeeded in reducing rural poverty significantly over the last 40 years. National poverty, both urban and rural, measured at the national poverty line, fell in 2008 to 15% despite the rapid rise in food prices at that time (World Bank, 2008a). However, this success has as much to do with factors outside the agricultural sector as within it. Value-added in the agricultural sector has grown much slower than in the nonfarm economy. From 1990 to 2005, agricultural GDP grew at only 2.3% per year (WDR, 2008), less than half the 4.8% growth in aggregate GDP over this period. Additionally, it has been one of the slower growth agricultural sectors throughout developing country Asia. Of 13 countries, Indonesia ranks 10th over this period. Only the agricultural sectors in Thailand, Sri Lanka and Malaysia have grown more slowly. This situation is not new. In the decade of the 1980s the agricultural sector grew at only 60% of the domestic economy, and within developing country Asia only three countries grew more slowly in agricultural GDP. Slow productivity growth is a sector-wide issue, although it is cited most often in the import-competing sectors of Indonesian agriculture, notably in rice and sugar. Indonesia has maintained export competitiveness in tree crops and spices. Its trade balance in agricultural products is strongly positive, at US$3 billion averaged over the three years 2002–2004, relative to comparable export values of $8 billion. Most domestic markets, including those for rice, sugar, maize and soybeans, are judged to be integrated with world markets (domestic and world prices highly correlated), despite the policy-induced differences in price levels that exist (World Bank, 2008c). We identify six major issues, chosen from the perspective of their political importance as well as what we judge to be their importance to the country’s agricultural development prospects. It is striking how similar they are to those in other agricultural sectors around the world, especially in the OECD countries. Producer-consumer food price conflicts, slow productivity growth, public support of biofuels programs, environmental conflicts, and poverty reduction have generated the key policy debates within the sector. The number one agricultural issue in Indonesia without question is rice policy. Only fuel would be considered as politicized a commodity as rice. Public policy involves raising the domestic price as well as increasing the degree of rice self-sufficiency. The current price is roughly 10% above the world price for medium quality rice, but a 50% margin has been a good guide overall from 2000 to 2007. There is a longstanding political demand for protection of rice in Indonesia. That protection takes the form of preventing decreases in its price through the use of trade policy instruments, namely a tariff plus exclusive import rights granted to a well-known state enterprise, the food logistics agency, BULOG. Rice continues to be the most important staple food, provides the main source of income for small farmers and is the main food expenditure for agricultural households in Indonesia. Rice represents 7.2% of average consumer expenditure and the sector employs 7.1% of the total workforce at the farm level alone (Warr 2005). Because more than three-quarters of Indonesia’s poor are net rice consumers, the rice price increase caused by current policy, on average, hurts the poor. Among rice farmers, the supposed beneficiaries of higher rice prices, land owners are likely to capture most of the gains, while wage earners in rice farming (the landless) capture little if any (Barichello, 2005; Patunru and Basri, 2009). Therefore, one might expect strong public resistance toward trade protection on rice, but the reverse is true. Rice protection has increased since the 1998 economic crisis, with little consumer resistance. This has been the government’s response to strong pressures from farm and rice producer interest groups to raise rice prices and a notable absence of political pressure against high rice prices from consumers and anti-poverty groups. Part of the policy attention to rice is manifested in the existence and mandate of BULOG. This agency has been charged since the late 1960s with achieving a policy-determined floor price for rice, using the instruments of monopoly control of trade, government financing, domestic procurement and seasonal storage facilities (World Bank, 2008b). These activities were considered important in the achievement of food security for Indonesia and the front line in this effort was rice self-sufficiency. This goal was part of the reason for high rice prices. But increasingly there has been a need for reform in this approach to achieving food security. Reform here concerns not only the structure and operations of BULOG but also the level of rice prices and the bias in crop prices toward rice. The search for alternatives to the current high cost rice policy began as early as the mid-1990s, in the direction of greater rice imports to ensure food security, and increased domestic productivity in the growing of rice. The latter requires greater investment in rural infrastructure, more agricultural research, and continued improvements in rural capital markets. The rapid increase in rice prices in late 2005 and 2006 following the 2004 ban on rice imports brought the domestic debate on food security into greater focus. But political pressures by the interest groups noted above stalled any real reform. Their influence is a notable change from the Suharto era. Since the post-1998 democratic reforms, agricultural lobby groups have become well organized, present politically forceful arguments, and are a significant factor in agricultural, especially rice, policy decisions. This policy regime has been strengthened by the Ministry of Agriculture’s interests in expanding domestic rice production with its own programs. Recently favorable weather and rice crops have allowed various interests to take credit for this higher production by pushing their own programs, whether they be new seed varieties or irrigation investments. The increased production has also temporarily removed the need for imports, removing any sense of crisis. BULOG itself has worked to limit policy change, given the substantial budget support (roughly half a billion US dollars) it receives for the rice procurement program to help farmers and for a targeted price subsidy for poor rice consumers, both of which it operates. This bureaucratic lobby work has prevailed. “No parliamentarians have been willing to take on both dimensions of the rice program simultaneously, and so the huge budget subsidies that accrue to BULOG to run these programs, and the corruption that accompanies them, go unchallenged.” (World Bank, 2008b) Despite the considerable need for rice policy reform, the window of opportunity to do it appears for now to have closed. The desire for protection and domestic self-sufficiency is not limited to rice. It extends to other food crops, namely sugar, corn and soybeans. The priority of these secondary food crops is lower than for rice but important nevertheless. A variety of protectionist measures going back at least to the early Suharto era have been used on these crops, whether they be imports administratively controlled through BULOG (sugar and soybeans), or tariffs. The regulatory details and politics motivating protection have varied, but there is uniformly a stated desire to achieve self-sufficiency. It is not possible for all these crops to be produced at sufficient levels to achieve self-sufficiency. They all compete for a similar set of basic resources, such as agricultural land. Expanded production of one crop to a large extent will result in less (or more expensive) land available for the others. This policy direction is not being matched with increased efforts to increase supply capabilities such as through agricultural research to increase yields per hectare. With the rice price raised sufficiently high to outcompete most other crops, moderate price increases from protection on corn, soybeans and sugar have relatively little effect on their production, even though it would be desirable for income diversification reasons to produce more nonrice food crops. The other important effect of this self-sufficiency policy is on consumers. As for rice, consumers finance this policy through higher domestic prices because they are caused by border restrictions. Poor consumers who wish to substitute nonrice cereals as a cheaper source of calories and other nutrients find this option less attractive due to these higher prices. On a related issue, trade policy is also being used with worrying results in the export sector, especially tree crops. Previously it primarily took the form of export taxes, mostly on crude palm oil to protect domestic consumers and encourage value-added in exports. The latter objective, however, has motivated a wider desire to ban the export of raw materials (e.g., logs, rattan) and more recently to ban the export of low quality cocoa, coffee and cashews, or to increase quality standards for these exports. This often hurts farmers and even reduces the export of high quality products in some cases, but the political economy at work is protection of the processing jobs at the expense of those harvesting or growing the raw material. This issue has arisen regularly since the 1980s. A more desirable policy direction for sustainable food security is to substitute productivity investments (discussed in Lack of Agricultural Productivity section) for border restrictions and to avoid export bans, taxes, and quality restrictions. A new agricultural policy issue is the encouragement of biofuel production. The objective is to convert 6 million hectares of land to biofuel production, based on increased oil palm production (Basri and Patunru, 2006). The expectation is that this would generate increased production of 22.5 million kilolitres of biofuel and create 3–5 million jobs. Additional biofuel initiatives have been proposed: banning crude palm oil exports and diverting this production to biodiesel production, and banning sugarcane molasses exports to use them instead for bioethanol production. Estimates of the 2007 budget cost ranged from Rp 1 to 13 trillion for these initiatives (Rp 1 trillion is equivalent to almost US$100 million at current exchange rates). In late 2008 mixing regulations for gasoline were introduced to require the addition of biofuels. The objective is to absorb more crude palm oil (CPO) produced in Indonesia and increase its value-added instead of exporting the currently large and growing volume. In addition the program is aimed at increasing the supply of green fuels produced in Indonesia to combat global warming, and, it is argued, reducing unemployment. This program has attracted more than its share of criticism. In addition to the questionable economic viability of these investments, and even their energy viability, they have been criticized for not offering a significant reduction in unemployment. To avoid the now well-known side effect of biofuels programs bidding up the cost of various food crops to some degree, this program could have been designed to support only oil palm production on dry land. These programs have included no such targeting to minimize food production conflicts. So far, only about 10-15% of domestic production of CPO is being used to produce biofuels, and there is no evidence of any effect the program has had on world prices, a concern because Indonesia is a major CPO producer. Because little is known about how large the budget commitment will be, what the true social and economic costs of the program are, and how much deforestation will be caused, the program remains suspect. The relatively slow growth of agricultural value-added is another important issue in the country’s agriculture, even though it does not merit newspaper headlines. Agriculture’s GDP share has leveled off at a high 15% (Figure 1). This slow agricultural productivity growth has persisted for almost three decades, despite bright spots like increased poultry production. This problem has damaged the country’s pursuit of increased self-sufficiency by limiting the crop yield growth and cost reductions that would enhance its comparative advantage in food crops. It has also reduced Indonesia’s international competitiveness in agricultural products. Without productivity growth, the only hope of reducing reliance upon imports is to restrict trade and raise domestic prices, exactly what has been done in food crops, with negative effects on consumers and poverty reduction. The seriousness of this productivity shortfall is finally causing it to receive serious attention among multilateral aid agencies as well as among government officials. High farm prices have not been sufficient. The Government of Indonesia with World Bank support has formulated a rural development strategy with an emphasis on reinvigorating productivity growth among rural producers and ensuring these measures are sustainable in the long run (World Bank 2007). The components of this strategy draw on established methods to enhance productivity and sustainable resource management. They include improving property rights to land by increasing the proportion of formal title certificates from the current 25%, improving water resource management through better irrigation operations and maintenance, and reducing water waste, groundwater depletion, water pollution, and soil degradation. 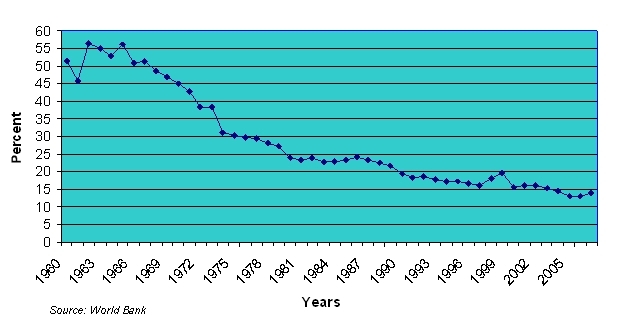 Agricultural research expenditures must be increased significantly after 20 years of decline. The details include replacing retiring senior researchers, integrating private sector agricultural research capacity (such as commercializing new varieties and hybrid seeds) with public sector efforts, reinvigorating sub-national adaptation institutes, strengthening biotechnology research capacity and giving greater emphasis to nonrice commodities. Extension services are equally in serious need of greater public sector contributions to upgrade educational qualifications, raise salaries, retain the most capable personnel, and coordinate with private sector and civil society extension providers. Rural infrastructure also suffers from a long term decline in investment. Reinvestment, including roads, rail and sea transport, irrigation, and electricity provision, is necessary both to support intensification of commercial agriculture and to improve living standards of the rural poor. Closely related to these productivity growth issues is attention to environmentally sustainable practices. This includes reduction of deforestation and pollution externalities from agriculture and food processing. Deforestation, partly from biofuel subsidies, has become a particularly pressing issue due to the contribution it makes to Indonesia’s greenhouse gas emissions. Reducing it, however, is complex and will be expensive. These matters have become an issue not simply due to increased environmental awareness in Indonesia but recognition that climate changes and less predictable weather are placing a premium on better environmental management. These concerns have been applied to the question of future rice productivity (World Bank 2008b), but the key question for success in better environmental management in agriculture is implementation and enforcement. This leads directly to the issue of local governance. Since 2001 Indonesia has embarked upon a major decentralization of economic power to the district level, with financial services, personnel, and responsibilities for basic services being allocated to district governments. This has since been modified by some increase in provincial government review and monitoring, but the basic thrust has been a devolution of power and resources to the regions from the central government. This is of particular importance to the agricultural sector because (a) local government policies and regulations are often very important, and (b) most agricultural commodities are regional (e.g., dominance of food crops in Java and tree crops in Sumatra and Kalimantan). But there is also the danger of inconsistent regional policies; trade policy and domestic pricing require national policies. This step has been welcomed by many observers as an antidote to widely-acknowledged corruption by the central government on many issues related to ongoing policies and regulations as well as one-time development projects. It was also seen as a valuable step to ensure more responsive management of local resources as well as to inject local data and concerns into various policy decisions, especially given the diverse ethnic and geographic composition of the country. However, the results have been mixed and the challenge of quality local governance remains. This comment summarizes the situation: “Overall, the environment for ‘good governance’ at the local level is weak and corruption similar to the national situation is endemic.” (World Bank, 2007a) The comment also highlights the need to reduce corruption within public sector activity in Indonesia, at both national and local levels. It remains important to the agricultural sector and contributes not only to problems of local governance but also to agricultural sector productivity levels, and the choice, enforcement and ultimate efficiency of various policies such as trade protection and domestic pricing. Decentralization has its advantages but is no panacea. 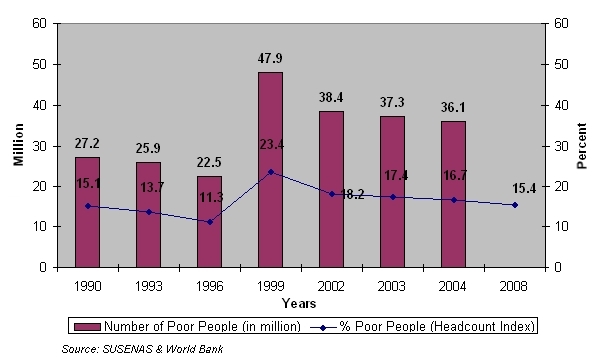 Poverty remains a major social issue in Indonesia, by any measure. Because most poverty is still located in rural areas, many agricultural policies embrace the rhetoric of poverty alleviation as one of their objectives. In the first two decades of the Suharto period, to the mid-1980s, agricultural policies that supported rice production contributed to pro-poor economic growth and reduced rural poverty. 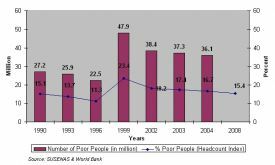 Figure 2 below shows Indonesia’s progress in poverty reduction: poverty declined from 1990 to the Asian Financial crisis of 1997/98, rose sharply with the crisis but declined again steadily from 1999 to 2008. But over the past two decades, the contribution of these policies to economic growth has been reduced; government priorities shifted away from productivity-enhancing policies and flowed to rice price protection policies whose costs were growing. In addition, the leverage of agricultural price policies on rural poverty has been reduced. Raising the price of rice no longer reduces poverty because the poorest Indonesians are net rice consumers, wage rates now appear to be influenced most heavily by the non-farm labor market, and the benefits of price policies have been strongly tilted toward farmland owners. There have been efforts to soften the impact of higher rice and cooking oil prices for the poorest consumers through targeted consumer subsidies (“rice for the poor” targeted 19 million poor households in 2008), and expenditures on these programs increased in response to the 2008 price increases. Overall, rural poverty has been reduced since 1999, seen in Figure 2, but this has been due to strong nonfarm economic growth and a dynamic rural labor market that features substantial off-farm employment and rural-urban migration. So although the alleviation of poverty is still promoted as an important issue for agricultural policy, this is now largely political rhetoric. Much more could be done. Barichello, R. (2005). “Economic Development and Poverty Reduction in East Asia: The Impact of OECD-Country Agricultural Policies,” Chapter 5 in Fukasaku, K., Kawai, M., Plummer, M.G., and Trzeciak-Duval, A., Eds., Policy Coherence Towards East Asia: Development Challenges for OECD Countries. Paris: OECD (Development Centre Studies). Basri, M.C. and Patunru, A. (2006). Survey of Recent Developments, Bulletin of Indonesian Economics Studies 42(3): 295-319. Patunru, A., and Basri, M.C. (2009). The Political Economy of Rice and Fuel Pricing in Indonesia, conference paper presented at Poverty, Food and Global Recession in Southeast Asia, Institute for Southeast Asian Studies, Singapore. Warr, P. (2005). Food policy and poverty in Indonesia: a general equilibrium analysis. The Australian Journal of Agricultural and Resource Economics 49: 429-51. World Bank. (2008c). How International Price Shocks Impact Indonesian Food Prices, Trade Development Technical Note, Issue 3. Richard R. Barichello (Richard.barichello@ubc.ca) , is Associate Professor, Food and Resource Economics, University of British Columbia, Vancouver, BC, Canada. Arianto Patunru (patunru@lpem-feui.org) is Assistant Professor, Department of Economics, University of Indonesia, Jakarta, Indonesia.